With the advent of smart-phones media consumption has considerably gone up. Gone are the days of memory constraints; even low-end devices today come with sizeable built-in capacities while high-end devices can house up to 64 GBs of internal storage. Ample digital space means users can easily carry their photos, videos, music and movies on their devices. While cloud storage services like Dropbox provide a convenient way of managing your data, they are not practical when it comes to large files and limited bandwidth. Directly copying files from your personal computer to your device still remains one of the fastest ways of data transfer. The following steps will walk you through the whole process and have you enjoying your media on your device in no time. Firstly (and quite obviously) you need to have your personal computer (Desktop or Laptop) with the data you need to transfer, up and running. You will also need a USB cable to connect your device to your computer. The cable would have come with your device, and is usually the same cable used to connect the charging adapter with your device. If you are using a Windows based machine, connect your device to your computer using the USB cable and wait for the installation pop-up to appear in the task bar. Now you need to swipe down the notification panel on your device. 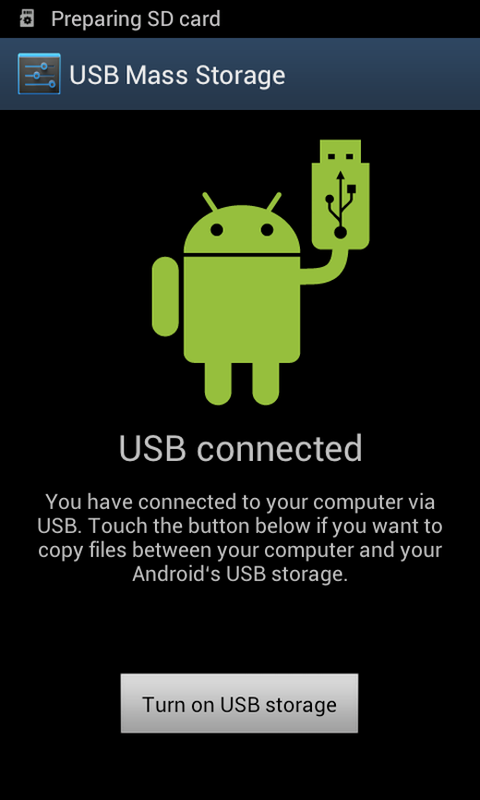 It should have the ‘USB connected’ notification which you need to tap. On the next dialogue box, there should be a ‘mount’ option which you need to select. This will enable you to see your device in the ‘My Computer’ window on your computer. Using your computer’s interface, now you can copy files to your device’s storage (both external and internal). Once you are done copying the files, it is advisable that you select the ‘Safely remove storage’ option from the task bar on your computer. This is a precautionary measure and prevents data corruption due to abrupt disconnection. After selecting the ‘Safely remove hardware’ option, you need to swipe down your device’s notification panel again and select the ‘Turn off USB storage’. Now you can disconnect the phone and use the copied files.